SoundSoap opens most popular media formats, including H.264, MPEG-4, WAVE, AIFF, AAC, MP3, FLAC and more. After cleaning, save to popular formats like M4V and AVI on Windows or M4V and MOV on Mac. On Mac, send your masterpiece with one click to popular destinations like Facebook, Vimeo, Email, Messaging, AirDrop, and more! SoundSoap even includes a Batch File Processor to automatically process any number of files. 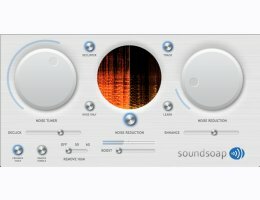 SoundSoap is an essential tool to have for anyone doing music production. When recording live instruments and vocals, there are many common problems such as background noises, hiss, hum, and distortion that SoundSoap can easily fix, keeping your production sparkling clean. SoundSoap works right inside most popular music production software, such as ProTools, Logic, Digital Performer, Nuendo, Cubase, and many others. Please note the standalone edition supports both mono and stereo audio tracks in video and audio files. Files with more audio channels are not currently supported. Supported file types for opening are determined by Apple’s AV Foundation framework. Please note the standalone edition supports both mono and stereo audio tracks in video and audio files. Files with more audio channels are not currently supported. SoundSoap opens most common media file formats on Windows including AVI, .MOV, M4V, FLV, and others. Fully functional except for saving/sharing until a license is purchased.